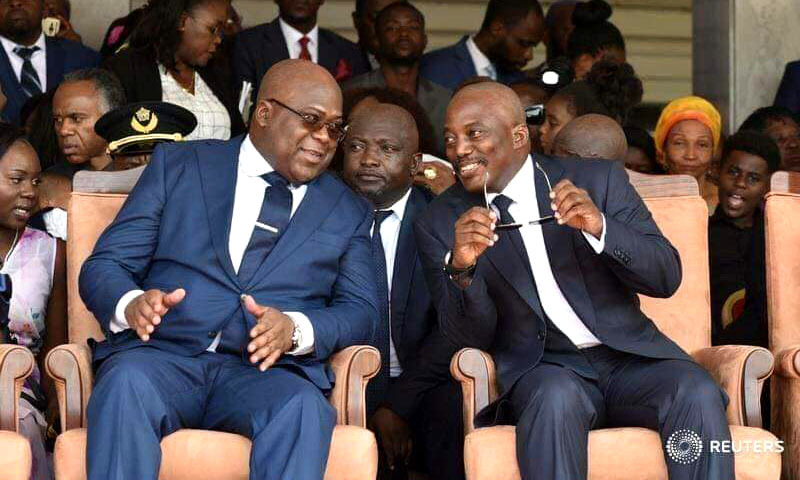 Kinshasa 08-02-2019 Politics - President Felix Tshisekedi had to deal with a government on another political edge- the FCC. French-style cohabitation whenever the presidential majority differs from the parliamentary majority. Coalition rather than cohabitation- This seems to be reflected in negotiations being held somewhere in southern Africa for the formation of the first government of 3rd legislature. These talks between the winner of the presidential election and those of the national legislatures seem so advanced that a plan for the sharing of ministerial portfolios is already on the table. It would count on a government team of 36 ministers and 9 deputy ministers. The PPRD, the largest party in terms of seats within the National Assembly, would give the Prime Minister, while the CACH, AFDC-A and AAB platforms would each have a Deputy Prime Minister. According to this distribution, a copy of which has reached at Forum Des As, the PPRD and CACH will each have 4 ministers and 2 deputy ministers. The group dear to Modeste Bahati Lukwebo, AFDC-A, will align 3 ministers and 1 deputy minister. Some platforms close to Moïse Katumbi, would participate in the government. These include AMK (2 ministers), G7 (1 minister) and AR (1 minister). This sharing suggests by itself an FCC-CACH government coalition, whereas in view of the results of the national presidential and legislative elections, the country had to technically engage in a cohabitation government. To know that President Felix Tshisekedi had to deal with a government on another political edge in this case, the FCC. Cohabitation as the French live it whenever the presidential majority differs from the parliamentary majority. From then on, we understand better the call to the coalition of the former president Kabila, in his ultimate address to the nation, just at the eve of the swearing of his successor. We also understand the conciliatory approach of the new head of state who constantly calls for the gathering of Congolese and reassures that there will be no witch hunt. Moreover, with regard to the Himalayan challenges that the country has to face and threats to its cohesion, the coalition formula seems to be the right answer to the two constraints mentioned above. Because, given the African realities, more specifically Congolese, a regime of cohabitation presents the risk of instability and division. In its current situation, the DRC does not really need to afford the luxury of another political crisis. Rather, it needs to bring together all political forces to meet the challenge of development. The historical success that began with a civilized transfer of power should not stop there.